Station Life in New Zealand is a collection of cheerful and interesting letters written by Lady Mary Anne Barker (nee Mary Anne Stewart) that is a New Zealand "classic". These letters are described in the Preface as "the exact account of a lady's experience of the brighter and less practical side of colonisation". The letters were written between 1865 and 1868 and cover the time of her travel with her husband (Frederick Broomie) to New Zealand and life on a colonial sheep-station at their homestead "Broomielaw", located in the Province of Canterbury, South Island of New Zealand. Although these letters are written with great humour and fine story telling, her life was marred by tragedy while in Canterbury through the illness and eventual death of her baby son. . . .I most anxiously watched the newspapers to see if they contained any notice of the sort, but as there has been no mention of any catastrophe, I suppose she has escaped safely. Her horse must have been quieter and better broken than they generally are. F—— says that probably it was a very old "station screw." I trust so, for her sake! Letter VII: A young colonist.—the town and its neighbourhood. I picked this book up because it was referred to in an economic history text. Of course, when you go into reading personal letters expecting insights on settler societies - you might be a bit disappointed. I picked this up in a Virago edition from the 80s. A light but charming little social document for the NZ-lit fan, with no shortage of literary merit (the vocabulary is apparently authentic and her descriptions of nature are really rather good). A fantastic account of one brave woman's experience of travelling to New Zealand and making a life in Canterbury between 1866 and 1868. Through her letters back to England it details her home life and her vivid accounts of excursions into the surrounding countryside. 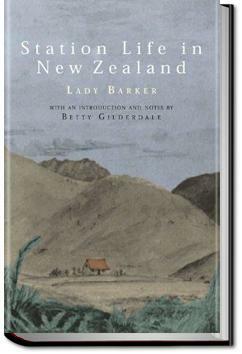 Station Life in New Zealand is a collection of letters the Lady Barker wrote to London detailing her life on a Canterbury sheep station in the 1860s, although presumably there was some editing in between as some letters seem to foreshadow the future ones.